Italy is one of the most popular tourist destinations, not just in Europe, but in the entire world. This beautiful country has thousands of years of history behind it and was home to some of history's greatest leaders, philosophers, artists, and more. Millions of people head to Italy each and every year, with a long list of popular cities all around the country including Rome, Venice, Genoa, Naples, Milan, Florence, Turin, Bologna, and Bari. From the Colisseum to the Leaning Tower of Pisa, Italy is home to some of the most special landmarks and monuments on Earth. Italy is also a country with a very long coastline and a lot of lovely seafront resort towns and beaches. 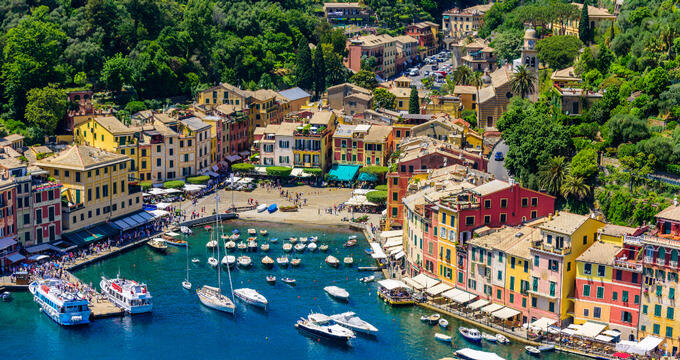 Of all the many beautiful coastal cities in Italy, Portofino stands out above the rest. Located within the Metropolitan City of Genoa out on the Italian Riviera, in the northwestern part of the country, Portofino is an old fishing village that has grown and developed over time into one of Italy's favorite resort locations. Various celebrities and artists have visited Portofino over the years, helping the town to build up a famous reputation, and the city has also been referenced and mentioned in many forms of pop culture media like songs, novels, and movies. The town is well-known for its colorful architecture, stunning scenery, gorgeous harbor, and old churches. It's such a beautiful place it has even been the home of many famous people through history like English film star Rex Harrison, French author Guy de Maupassant, and even King Richard I of England back in the 12th century. If you’d like to plan a trip to Portofino, read on to learn more about this pretty resort town. The closest major airport to Portofino is Genoa Cristoforo Colombo Airport, commonly known as just Genoa Airport. This airport is served by several major airlines like British Airways, Air France, Easy Jet, Lufthansa, KLM, and Ryanair, so it's relatively easy to get there, though you may have to take a connecting flight from a city like Paris, London, Munich, or Amsterdam. From there, Portofino is about 30 miles east along the coastline. The drive takes about an hour, so renting a car is an option. If you prefer to rely on public transport, you can hop on a train to Santa Margherita and then take a bus or taxi to Portofino. There are multiple hotels to be found in Portofino, as well as private rented accommodation. Read on to learn all about the best accommodation options in the area. Located less than five minutes from Portofino's iconic, beautiful harbor, Hotel Eden is one of the best options for accommodation in this gorgeous Italian town. It's a simple hotel, with nicely decorated rooms, affordable rates, free breakfast included for every guest, and a nice outdoor space with garden and terrace. Free Wi-Fi access is also offered to all guests and this is a good spot to base yourself for a trip to Portofino. Nestled in a wonderful spot right on the coastline, with rooms offering stunning sea views, the Piccolo Hotel Portofino is one of Portofino's best hotels. Past guests have fallen in love with this charming location, which features a nice array of contemporary rooms with good features and facilities. The on-site restaurant serves some really tasty food and breakfast is served free of charge every morning. The rustic exterior of this hotel is nicely contrasted with the modern decor and this is a great place to stay if you're looking for luxury and comfort during your time in Portofino. If you're traveling with a special someone and looking for an intimate, romantic hotel in Portofino, the Hotel Nazionale could be the right choice for you. It's right by the marina, offering stunning views from the on-site restaurant and many of the rooms, some of which feature balconies. Free breakfast is included with every reservation and the hotel is just a short walk from many of the best attractions and landmarks in Portofino too. Not only that, but the room rates here are very attractive. There’s plenty to do in Portofino. Read on to learn about some of the must-visit landmarks in the town. Located on the Via Alla Penisola, not far from the Portofino harbor, Castello Brown is an old castle that was built many centuries ago and is still standing to this day. It's a wonderful historic location, housing many old artifacts and relics from the past, allowing visitors to take a trip back in time and learn a lot of fascinating things about the history of the area. Just a short way out of Portofino, between the town and the neighboring town of Camogli, sits the Abbey of San Fruttuoso. Built way back in the 10th century, this is one of the oldest landmarks in all of the Italian Riviera. It's a beautiful Catholic parish sitting at the base of a large hill, and it can only be accessed by boat, so you'll need to reserve a tour in advance. It's definitely worth a visit though, and this is also where you'll find another of Portofino's most popular landmarks: Christ of the Abyss. This is a sunken bronze state of Jesus Christ which sits beneath the waves in the bay just off the coast of San Fruttoso. A stunning example of Baroque architecture, the Chiesa di San Giorgia (Church of San Giorgia) is another of Portofino's most beautiful and historic buildings. It dates back several centuries and is closely linked to a nearby lighthouse on the Punta Del Capo, so you can spend a full day out here and see two wonderful sights at the same time. Some excellent hiking trails can be found in the area and you'll definitely want to bring a camera along to snap some photos for the folks back home.